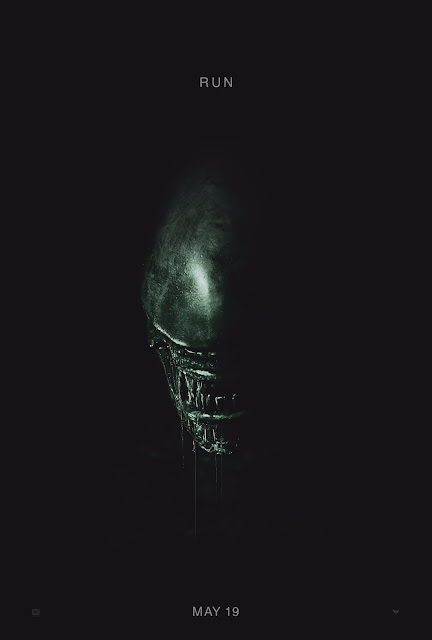 As an early, consistent, and vocal supporter of Prometheus (2012), I can only assess Ridley Scott’s follow-up, Alien: Covenant (2017) as an intriguing but ultimately uninspiring affair. The sequel is intriguing primarily because Scott brings his trademark intellect to the tale, giving audiences a new and worthwhile musing on the nature of God(s) and men, or, rather, parents and children. Yet Alien: Covenant is uninspiring too, because the quest for ultimate truth or knowledge that was so important to Prometheus (2012) has been replaced with a torrent of easy answers. The movie’s modus operandi is to fill in all the “gaps” between Prometheus and Alien (1979), and, at least for this reviewer, that’s a dispiriting and ultimately self-defeating approach for a franchise that prides itself on exploring the unknown. 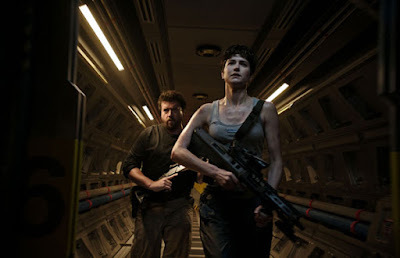 The easy answers presented by Alien: Covenant don’t really satisfy, and in some way they actually foreclose on the sense of majesty and mystery that has characterized the Alien franchise for decades. The issue here is that it is inherently better to search, or to explore, than to provide easy answers. Prometheus was all about raising questions.It raised interrogatives about the Engineers, the xenomorphs, mankind’s beginnings, and even, finally mankind’s future. 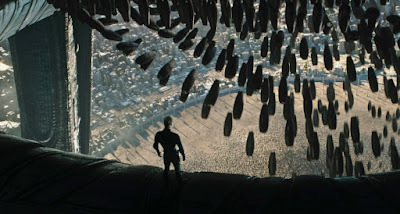 I am well aware that many fans actively disliked the film, and yet Prometheus was a bold, even drastic step in a new direction; one which opened up the possibilities of the Alien universe in magnificent, literary, and imaginative ways. After so many years of largely unsatisfactory re-hashes, it was a breath of fresh air, and the re-assertion of the franchise’s possibilities and scope. By contrast, Covenant is a relatively routine Frankenstein story (a mode, yes, which was certainly implied by the title, Prometheus). The sequel exists simply to tie everything together into a neat bundle. The result is a film that, I believe, fails to spark the imagination -- to inspire -- the way that Prometheus so abundantly did. I do not write off Alien: Covenant as a total failure, however. Scott has crafted a film here of some remarkable depth, especially in its first half, even while retreating to familiar franchise tropes in the last half. All the Alien films must strike a unique note so as not to be seen as a rip-off of previous entries, and in truth, Covenant possesses its own unique vibe, which I’ll attempt to explore below. I describe this vibe as, well, sinister. We have seen evil before in the Alien universe, of course. Sometimes that evil has been brought forward by man (Burke in Aliens 1986]), sometimes by machine (Ash in Alien ) and sometimes by nature itself; the “hostile” biological instincts of the titular xenomorphs. But there is no other film -- at least yet -- in the Alien saga that plunges so overwhelmingly into the darkness, into sinister agendas and horrific, hellish sights. Even Ripley’s death in Alien3 (1992), by contrast, served a pro-social or humane purpose. In Alien: Covenant, an overwhelming diabolism seems to permeat the picture, in keeping with David’s Milton-ian line of dialogue that it is better to rule in Hell than serve in Heaven. This sinister quality makes the film feel both oppressive and portentous - which is, admittedly, not a bad note for the middle piece of a trilogy to strike -- but the grim atmosphere does not make the film scary, or inspire speculation and interest. I know that folks read movie reviews for a critic’s assessment, a binary yes/no, thumbs-up/thumbs-down judgment. If you’re at this blog, reading this review, you already know I rarely tread into that territory of absolutes. How you ultimately come to feel about Alien: Covenant could rely on a lot of different things. How did you feel about Prometheus? What do you seek from an Alien film? And so on. At this juncture, I can judge the film well-made, well-performed, and disturbing on a psychic and visceral level, even though there is no set-piece here that compares favorably with Shaw’s on-the-spot surgery in Prometheus. Also, I can detect the “dark” intelligence lurking behind Alien: Covenant, but, I suppose, finally, that I wish that intellect had been directed more fully towards a story that furthered the mysteries of the Alien-verse rather than limiting them. In 2104, the colony ship Covenant carries 2000 humans in hyper-sleep, and voyages to distant Origae 6, which needs to be terra-formed to be fully livable. A random neutrino burst from a nearby star, however, damages the ship, and kills the ship’s captain (James Franco) in cryo-sleep, leaving his wife, Daniels (Katherine Waterstone) bereft and questioning life. While on a space-walk repairing the solar sail apparatus, Covenant’s pilot and technician Tennessee (Danny McBride) intercepts a signal in space which seems to originate from a human being. The Covenant’s new captain, a “man of faith” named Oram (Billy Crudup) orders a change in course to the signal’s point of origin, a mysterious habitable planet in its system’s Goldilocks Zone. In fact, Oram wants to scrap all the carefully made plans for Origae 6 and settle on this newly discovered world instead. Daniels feel it is too much a risk, but has no choice but to go alone. The Covenant sends a lander down to the planet, but almost immediately, the excursion goes terribly wrong. Members of the reconnaissance team are infected by strange black spores, and impregnated by parasite neo-morphs, which burst from their bodies in horrific, bloody fashion. The survivors are rescued by a stranger, an android named David (Fassbender), who seems an (almost) perfect match for Covenant’s synthetic man, Walter (Foster). But David hides a dark secret about the source of the message that brought the Covenant to him, and the fate of Dr. Elizabeth Shaw (Noomi Rapace), of the Prometheus mission. Furthermore, secrets, horrors and monsters abound in David’s new home, a necropolis that once served as home to the Engineers. That definition doesn’t totally apply, however. There is, in David’s story (and agenda), a rejection of religious and moral principles, certainly. But David makes it plain, through his words and deeds that life that to him is not meaningless. Rather, the purpose of his life is to create new life, and destroy his makers, the human race. His purpose is to make the universe a Hell, one in which he reigns supreme. Consider, for example, what David does to Elizabeth Shaw. After he kills her, he utilizes her body to create his children: the aliens. Elizabeth’s fate is horrible enough to consider on its own, but when one remembers the details of Prometheus, it is even worse. Elizabeth’s search for the Engineers arose, in part, from her inability to create life herself. She was infertile, and therefore deprived of a biological capacity that she believed gave human life purpose. Yet in her death, David has, ironically, “gifted” Elizabeth with this capacity. In a biological sense, she is now the mother to the xenomorphs. From a certain sense, her dream has come true. Captain Oram, a “man of faith” is similarly treated in a sinister fashion. He feels victimized by his crew-mates because so few people share his Christian beliefs. And as captain, he makes a difficult choice, believing that the Covenant’s discovery of Shaw’s signal and the Engineer world signal a form of “providence.” It is a sign, that he should lead his people to this new promised land. Oram feels validated in his faith, which has brought him to this junction, to this decision. Of course, he has been lured to the planet by a devil of sorts, in David, not by divine intervention. And David is responsible not only for the death of his wife, but for Oram's death too. Oram becomes the first human being in history (at least in-universe) to be implanted by a face hugger. His faith has led him not to a promised land, but to Pandemonium. The film is filled with such examples of diabolism. David has, for his own reasons (perhaps the murder of his father, Weyland), committed genocide against the Engineers. We see a scene (in flashback) in Alien: Covenant of apparently-peaceful Engineer citizens destroyed in a WMD-style attack. Their own bio-weapon (the black goo, for lack of a better description), annihilates them. Again, we have seen death before in the Alien films, but not on a scale such as this. A whole population is wiped out, horribly. And then, of course, the film ends with an Evil force literally driving the ship. David has tricked Daniels into believing that he is Walter, his more benevolent sibling. She goes into cryo-sleep helpless and defenseless, with the devil tending to her slumber. And remember, David has already made his intent towards Daniels plain. When she asks, in the necropolis, what David intends to do with her, he replies that she will suffer the same fate as Shaw did. Our Ripley-in-training here is clearly a goner. And still, the story is even darker, yet. Now facing no opposition, David is in total control of Covenant and its cargo. He has 2,000 sleeping human beings to experiment with, not to mention a cargo-hold filled with human embryos. His ability to play Frankenstein, to “hone” the shape and form of his children, the aliens, is now magnified geometrically. The Alien saga has always been dark, always been frightening. But before this film, there has always been hope. Even in the third Alien film, Ripley’s sacrifice meant something. It preserved the future of the human race. Here, there is no hope to be felt. David is in control of the surviving heroes (Daniels and Tennessee), and all the raw ingredients necessary to make our universe his particular nightmare. This oppressive, dark turn is effective, as I’ve noted, if one considers this film the middle-part of a trilogy. This movie is the equivalent of The Empire Strikes Back (1980), in other words, the point in which good is defeated, and the stakes are the highest they’ve ever been. If taken on those terms, the darkness makes dramatic, artistic sense. Equally intriguing is the overall theme behind this level of darkness, which involves Gods and men, parents and children. Consider that “God” (if there is such a being) created the Engineers. The Engineers then created man. Man created David. And now, David creates the aliens. These movies are thus about the act of creation, and furthermore, the way that parents and children deal with resentment through rebellion. The Engineers attempt to kill man, their child, in Prometheus. David’s act of rebellion against his God (mankind) is to create his perfect children, the aliens. He is a fallen angel, like Satan, surrounding himself with an army of demons by which to mount an assault on the heavens, if not heaven itself. Of course, the question for the next movie is simple: how will the aliens rebel against their father (David)? It could be by creating a hive-mind, taking ownership of their own biology (through the birth of a queen), and so on. The covenant of the film’s title might be interpreted in many illuminating ways. A covenant is generally considered to be a pledge, a promise, or contract. Many scholars define a covenant specifically as a contract between man and God. What we have in this film, then, is the breaking or destruction of a covenant. Yet David -- our antagonist -- is not actually the party who breaks the contract, one might conclude. Rather, he is the injured party, upset about the shattering of the covenant; upset at the betrayal by God. In this case, it was his father, Weyland, who broke the contract. He made his child only a "thing," not a person to be loved. 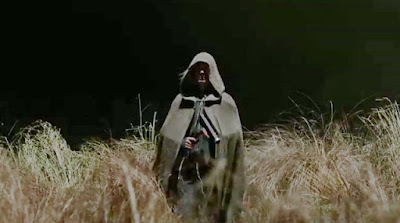 The film also references Ozymandias (1818) a poem by Shelley that David mis-attributes to Byron, until corrected by Walter. Ozymandias concerns the impermanence of empires, and the (futile) quest for a legacy. If nothing is permanent, what is left of us once we depart this mortal coil? Weyland believed that his legacy could be immortality. That’s why he sought out the Engineers. Importantly, he did not view David as his legacy. Similarly, the Engineers appear to view humans, their creation, as monsters and competitors, not children. The outstanding question is: how does David view the aliens? Are they to be his legacy, and if so, what do they represent? My answer? They represent his righteous hatred. The aliens in their simplicity and purity make a mockery out of our own reproductive cycle, and view humans not as beings with a divine spark, but as “meat” to be re-shaped in the service of other life-forms. I do wonder, however, how David -- a being who appreciates art and music -- could conceive of “perfection” in these aliens. They have no such calling to civilization, or art. They have no higher reasoning skills. He has made his children, essentially, emotionally empty. All of this text and subtext is here to be enjoyed and admired in Alien: Covenant, and so the film will merit many re-visits in the years and decades to come. I look forward to seeing it again. And yet, I am gravely disappointed with the fact that the film re-parses the origin of the xenomorphs. They are no longer from “out there” (the product of an alien intelligence), but explicitly created by David, in the year 2104. I am not upset that this development essentially un-writes the AVP movies (which feature aliens on Earth in the year 2004) or the connections to the Predator universe. I am, however, disappointed that a franchise titled “alien” has decided to explain so much, and made the explanations so, well, earth bound. One of the most amazing facets of Alien was the terrifying feeling that the crew of the Nostromo was reckoning with something beyond human experience, beyond human history, beyond human morality, and beyond human origin. The xenomorph was born of something, well, different. It was so “alien,” in fact, that it couldn’t be understood, or even killed. Now, we understand that humanity was intimately involved in the creation of the xenomorphs. It is human parenting, actually, that is responsible for their shape and nature. It was very different to learn of the Engineers (another alien race) and their role in creating humanity in Prometheus. There were still so many unanswered questions there. But Alien: Covenant reveals that the xenomorphs are the revenge plot of a rejected child, in essence. This disappointing and totally unnecessary explanation changes the nature of the franchise immeasurable. And I don’t believe it is a good change. I liken it to the development of the Michael Myers character in the Halloween franchise. Originally, he was the “Shape,” an impenetrable figure on a rampage in his home town, Haddownfield. Was he a serial killer? A developmentally-arrested individual playing “trick or treat” with life and death? Or was he, actually, the boogeyman? The ideas were all terrifying, and there was evidence to support each approach. But then, in the second movie, we learned that Michael was out to kill all surviving family members, and that explanation limited his terror somewhat. The explanation made his evil seem mundane. Alien: Covenant diminishes the horror of the franchise in the exact same way. The more we know and understand about the xenomorphs, the less terrifying they become. Familiarity breeds contempt. At least in terms of horror. The most terrifying (and successful) elements of Alien: Covenant, not coincidentally, involve the neomorphs. They are things we have not quite seen before. They are new and mysterious, and therefore scary. I do not mean to suggest that David’s story is unworthy, or uninteresting, but rather that the back-story of the xenomorph creation removes a wonderful and scintillating aspect of mystery from the entire saga. I suppose we live in a time that demands easy answers, and spoon-feeding. Some critics have even seen Covenant as an under-the-cover tale of how Hollywood directors must make Frankenstein monsters out of their own creations if they wish to tell an original story in these times of “shared universes” and “franchises.” That's a clever reading of the film, but not one I am entirely certain I subscribe to. I am grateful, however, that an artist as clever and intellectually curious as Ridley Scott retains the reins of this franchise. I think he moves it in the wrong direction here. But he moves in the wrong direction...in the most beautifully and thoughtful manner possible. I but can’t help but feel, at this juncture, that Scott's take on Prometheus was the right one. I would have liked to see a sequel wherein David and Shaw go off to discover more about the engineers. Instead we get a sequel in which we learn more about the aliens. Too much about the aliens, for my taste. This is a story that we don’t need to see, no matter how well-shot or well-acted. By giving us too much information about the xenomorph genesis, this 2017 film risks “spoiling” the whole symphony. John, brilliant review that I absolutely agree with all that you have stated. Ridley Scott has made his Empire Strikes Back(1980). David is his Darth Vader in both Prometheus and Covenant. These films are David's story as the others were Ripley's. We cheered for Ripley and we are horrified by David. David reminds me of Norman Bates in Psycho(1960). I can not agree with you more regarding Ridley Scott's mistake and our disappointment with the "man-made" revised origin of the xenomorphs. It makes the mystery of the events of the Nostromo and space seem small with this new origin. Prometheus ending with David and Shaw going off to discover the engineers origins should have led to a better sequel than Covenant. Elizabeth’s fate now joins the senseless fate of Hicks and Newt. Maybe, Ridley Scott wants to make the third film in David's story a redemption story with a positive ending. If there is a third film I hope the engineers are still in it. I suggest these xenomorphs are a "David variant." The eggs are larger, the chestbursters are more developed, and the adult is slightly different. I think it's clear these are not the same as those found on the derelict in Alien. It's as if David has studied the Engineers' work, and is following in the Engineer's footsteps, but hasn't quite perfected the process. Recall the mural in the Ampule Room in Prometheus - the Engineers have long known about the xenomorph. I don't think the origin of the xenomorphs is conclusively solved, as we still don't know if they were originally created by the Engineers. Alternately, it's still possible the Engineers discovered them on some other planet and reverse engineered their biological weapon from xenomorph DNA. I appreciated your thoughts regarding this film. I'm not sure I'd be able to write something so well-parsed. My response to the film was on a purely visceral level. I very much enjoyed the opening 30 minutes - it felt completely like I was on a colony ship in a future time. I loved the solar burst, the establishment of the notion that humans can meticulously plan and anticipate, cross all the t's and dot all the i's and still will not foresee something random which changes everything. It sets up nicely what is to come. The ensuing chaos and fixing the sail, and the unexpected distress call, are all nicely done. The film looks gorgeous. David's first appearance is great, as is the flute scene. It's hard for me to determine where it took a turn for the worse, but once it did, it sprinted towards worse. I found myself frustrated with the sheer unprofessional behavior of all the principals. This is a complaint often levied against Prometheus, but I found it similarly damning here. Why is the captain going into that basement laboratory with David by himself? I wanted to shout at the screen! The final switcheroo landed with a thud; really, who didn't see that coming? I probably won't be there for it. I am willing to acknowledge the merits of a work to a point, but even The Empire Strikes Back didn't leave me feeling so...bereft. Alien 3 was a film I warmed to with your encouragement, and say what you will about Newt and Hicks, the film is a powerful statement about overcoming adversity. Alien: Covenant didn't leave me wanting more. It left me wanting less, if that makes any sense. A promising start descended into slasher-film territory fairly quickly. Pop quiz: Does anyone know the name of the crewman who got his jaw torn off by the alien? Does anyone care? When the shower scene happened, my eyes rolled so far back in my head that I swear I caught a glimpse of my spine. A beautiful, multi-million dollar slasher film is still a slasher film, no matter what you call it. The first Alien trilogy was enough for me. After seeing Prometheus and Covenant, I think I've seen enough movies named after doomed spacecraft to last me a lifetime. I had high hopes when I sat down to watch this film, but hope was the last thing on my mind by the end credits. A review with laser-like precision. Excellent to read your interpretation and analysis. I guess we have an idea of what David whispered to the Engineer in Prometheus to cause such a violent reaction in that film. Is Scott above being criticized for ignoring this franchise for 33 years? In the cinematic age of "universes" I see Scott's return as a purely personal cash grab. Fassbender, terrific actor, the whole Alien universe apparently centers around his characters that he plays now. And just to rehash Prometheus, not once, in Alien, did the crew of the Nostromo make irrational or stupid decisions. Prometheus should be renamed "An Idiots Guide To Space Travel". It was a bad film. Convenant, in my opinion, was better, solely because Prometheus so drastically lowered my expectations of a Scott installment. Scott is really in it only for the money. He said as much about Disney buying Star Wars. "Star Wars is going to be a juggernaut! Why do you think I'm doing sequels?" He's also doing Blade Runner 2049. There you have it.